Why did B2yoR develop its own system? Why bother with Paddock Review at all? The Sections 1 to 7 of this Paddock Review description were written in late 2004 to early 2005 just before the B2yoR website was first published on the Internet. In the intervening period the approach to the Review used by B2yoR has developed in a number of areas although the core of the methods remains the same. During this period B2yoR has also been involved with a major project using 'Classical Paddock Review' which uses methods targeted at assessing a horse's wellbeing before a race. The B2yoR approach, although with some overlap areas, is different in that it's aim is to assess and quantify a horse's basic level of ability. Applying the B2yoR methods to fields of unraced and lightly raced horses, which predominate in many 2yo events, will give an edge in analysing a race before it is run and also in specifying the future value of the form. Therefore the Sections 1-7 could do with an update to reflect the changes and to integrate the knowledge gained from the 'Classical Review' project. But, to do full justice to that brief the rewrite could turn into a major project and perhaps become too prescriptive. One day the 'B2yoR Paddock Review' book will emerge which is where a full update will ultimately lead. In the meantime this article has had some minor edits applied. Nearly all of these have involved small changes to tighten up the sentence structure and to clarify meaning in odd places. In the Sections 1-7 the only notable change has been in the '50 to 90 Rating System' sub-section. This originally said that B2yoR used a BHA Official Rating (OR) figure of 70 as the baseline for a horse capable of competing to win average quality Open Maidens. Regular readers of the site will know that OR75 is now the figure used. The OR range 70-74 is actually a fascinating subject in it's own right and in Paddock Review an OR71 horse is notably different from an OR74 one although both are likely to be 'Eternal Placer' types unless they fall into a lesser quality maiden. It is worth noting that the BHA's dedicated 2yo Handicapper (Matthew Tester) works to a rating range around 69-71 to land his Median figure on when the Nurseries start in early July. Since this is the 'Average' you will see a large number of horses in the OR65-75 range and probably a reason why intensive study will show up structure that is classifiable down to a 1-2 point range in Review. Keep the existing Sections 1-7 as a good introduction to the B2yoR Paddock Review and done with some energy and positive drive. Add an 'Afterword' as Section 8 which briefly discusses a couple of changes to the B2yoR approach since 2005. It also gives a small insight into the 'Classical Review' project and a few of the items learnt. Also included are two new 'Virtual Paddocks' to solve using the higher quality pictures on the site which started in 2008. These are both 'easy' in the sense that they involve a wide range of equine abilities. B2yoR would expect anyone stopped in the street at random, let alone a person reading a horseracing website out of choice, to be able to separate the very best on show from the less able athletes. Encourage the interested reader to look through the Race Previews linked to from the 'B2yoR Anthology' article which dealt with Paddock Review areas. These cover the period from 2005 to 2010. Encourage the really interested reader to pose any further questions direct to B2yoR by e-mail. One of the examples given in the Afterword came out of such an exchange to make the point. B2yoR's view would be that if a Pundit cannot explain an issue succinctly, place the answer in a general framework and provide some examples to clarify things then they probably do not really know what they are talking about. Always worth being tested with a few curveballs so feel free to offer one. 1. What is Paddock Review? Description of physical type in a well known standard form, including simple measure of athleticism. Estimation of fitness on a well known scale. Numerical Rating of each 2yo as a physical specimen relating to the best Official Rating (OR) that the 2yo is capable of acheiving in reality. Many, if not the majority, of 2yos are given inflated ORs by the BHA handicapper and the aim should not be to match these unrealistic ratings caused by the methods the handicaper uses. Summary of the horses likely distance aptitude and their capacity for physical development through the remainder of the 2yo season. These ratings and descriptions can then be used, both on the day and in future, to provide assessments of a horse's chances in a particular race. Using the paddock review information of all horses in a race is also useful in assessing the quality of a race and its likely future influence. The other sections in this page give an outline of the system which B2yoR uses for Paddock Review and why it developed. It also, hopefully, makes a strong case that the use of Paddock Review is open to everyone and is not confined to use by a small group of self perpetuating insiders. 2. Why did B2yoR develop its own system? There was very little Paddock Review information available and it did not cover most races. The information that was available was vague, imprecise and was not based on a well defined set of criteria for assessing and rating horses. Without the explanation of the basis for assessing the horses and without quantified ratings as output any Paddock Review information is of little use. The Paddock Review information tended to target details of appearance and conformation such as coat appearance, sweating, feet size, hip to hock length, etc. Experience suggested that these items were secondary factors, at best, in assessing a 2yo as a physical specimen. This amounted to concentrating on the final 10-20% which goes into assessing a 2yo without looking at the overall framework first. Experience showed that a different approach was needed to assess horses that targeted getting a good understanding of the large factors which affect a horses ability to make an effective athlete. Therefore concentrating on the factors which make up the initial 80%+ of a horse's overall ability. Once you can assess these factors quickly it is then possible to start adding assessments of more detailed factors to see whether they have any identifiable effect. The reverse process of targeting the 10-20% of details and trying to add the basic 80-90% later is going to waste much time and probably lead to disillusionment before getting to the 80% items. What grew out of this dissatisfaction along with B2yoR's own trial and error experience was a system to assess and rate 2yos targeting the main items that affect a horse's athletic ability. The system defines what factors are important and uses a consistent set of descriptive language and ratings. This means that the success of paddock reviews can be continually reviewed to identify any problems and improve the system. For example review has shown that B2yoR used to under-rate smaller, but strongly built, 2yos. Also, horses with white feet were often given too high ratings for athleticism because they appear more active. A classic case of reacting to 'go-faster' stripes. Having a defined format and going back to check ratings has enabled these biases and other issues to be identified and corrected. (SIZE and BUILD) as assisted/hindered by (GEOMETRY and ATHLETICISM and TOGETHERNESS). "Is that it?" you may well be saying, followed by "there must be more to it than that!". Experience has shown that people expect to be drizzled with conformation details and horsey jargon by those they believe to be 'paddock experts'. But the same experience has shown that this expectation is wrong and you need to avoid getting bogged down in details and jargon and look at the overall framework first. The details are important when you are buying a horse because you need to assess whether a yearling will survive the training regime and be able to run a reasonable number of times on the racecourse. The big advantage when you are doing paddock review is that the 2yo will already have been through the initial training regime. If they have survived the training and are on the racecourse then they haven't got a defect which will stop them running at all. 3. Why bother with Paddock Review at all? Have you ever watched a 2yo race and found yourself frustrated as the odds-on favourite, with a splendid pedigree, from a top trainer gets beaten? That was going to be your banker winner of the day. Have you ever found yourself mouthing "How are you supposed to find that? ", as the 2yo race is won by an unconsidered long-shot? Almost certainly the answer is "Yes". Is there any way to improve your chances of identifying these traps before you fall into them? If you only use form analysis, previous statistics, pedigree analysis, listening to pundits, etc. then, unfortunately, the answer is "No". You will be climbing out of traps for the rest of of your racing and punting career. There is one good way to avoid a lot of the traps - Paddock Review. It is probably the best way to get a real understanding of how racing 'works'. Everything that you see in daily racing - beaten favourites, long-priced winners, horses achieving winning sequences, horses failing to stay, etc. - is the result of the capabilities of the horses and how they have been prepared by the trainer. Along with how this preparation interacts with the British handicapping system & methods as well as the types of races available to run in. As you develop your knowledge of physical types you can look at results of races and understand why the outcome occurred. The really clever bit is then to develop further so that you expect 'surprise' results. It is personally very rewarding developing a real understanding of racing. It is also very revealing once you have enough knowledge to be able to identify the experts and pundits who really aren't worth listening to. If you are primarily interested in betting then Paddock Review is an excellent way to get a real 'edge' for betting. The majority of widely available information (previous form, statistics, etc.) will have been assessed by many individuals and groups. Most of them with more time and resources than you have so it will be extremely difficult to find that 'edge'. But your Paddock Review is your own opinion and you will find opportunities where it is obvious to you that the betting market is wrong. Additionally the understanding of racing gained will enable you to interpret the usual information sources, such as previous form, more efficiently. Let us go back to the example of beaten odds-on favourites and winning long-shots in 2yo races. If you make a point of looking at beaten odds-on favourites, even later in the season if necessary. you will almost certainly see why they struggled to come up to external expectations. Even though they are well related and with a top trainer they will be moderate to average physical types and they were beaten because too much was expected of them. The trainer wasn't incompetent, nothing underhand took place, the horse is simply an average athlete, at best, and the SP was wrong. Despite what some systems suggest and pundits may say a horse's pedigree, connections and sales price do not ensure a better type. These factors are often overbet in the Starting Price Market and lead to unrealistically short SPs. If you have seen and rated a field of 2yos before a race you will probably find that the long priced winner was among the better physical types. Again, the SP is probably wrong because of external factors, most notably with unfashionable trainers. Paddock Review will remove the majority of these 'surprises' and offer good betting opportunities as it does so. then producing a final overall rating and summary by considering the 5 main area ratings as a whole. (SIZE) describes the size of the framework of the 2yo, its height, length and width. It is suggested a simple 1 to 5 scale is used with 0.5 progressions allowed (i.e. 1.5, 2.0, 2.5, etc.). This is an area where initial experience is needed to see the range of sizes you will expect to see in 2yos. Judging the size can be affected by issues such how far away from a horse you are standing and by the scale of objects making up the background. This is a good example of why you should have a consistent method for reviewing horses, including standing a set distance away. The suggested distance is around 15-20 feet and the side-on view is the most important. With experience you should be able to split the 2yos into three initial categories - too small, acceptable, too large (and usually not well developed enough to carry their size). Within the largest group (acceptable) you should prefer bigger horses so long as they have acceptable characteristics in other areas. The smallest 'acceptable' horses will have limitations on their ability and usually their distance aptitude. Other than in the shortest races (usually 5f) and probably in faster conditions a smaller horse will be outstayed by similar bigger horses. If you follow human athletics you will probably know that a 60 metre indoor sprint is a very different test from an outdoor 100 metre sprint. The 60m race allow smaller sprinters with fast starts to get a lead early and hang onto it. In the 100m races the bigger runners, with more efficient strides, have a higher top speed of around 28mph compared to 26.5mph and can maintain that top speed for longer. The 100m race therefore allows the bigger runners to overhaul the small, sharp starters between 60-90 metres of the race and be going away at the end. To stretch the analogy a little further it is the same reason in rugby why Jason Robinson can run away from anyone in the first 20 metres of a sprint but will be overhauled by bigger 'speed' players in a length-of-the-field chase. (BUILD) describes the muscular bulk that is present on the framework (SIZE). It is suggested a simple 1 to 5 scale is used with 0.5 progressions allowed (i.e. 1.5, 2.0, 2.5, etc.). With more experience you may wish to extend this single figure to rate different areas of muscle bulk separately. For example this could be as simple as splitting the rating into a 'Front' (Shoulders, etc.) and 'Back' (Buttocks, etc.). As with the (SIZE) estimates you should relatively quickly be able to separate horses in three initial categories. Too lightly built, acceptably built and too heavily built (and therefore probably not developed nor strong enough to carry their weight). The main task of reviewing is then to assess the relative merits of the largest ('acceptably built') group who will range from relatively lighter builds to heavier than average builds. This will develop with experience but the following basic points should be borne in mind. Horses, like humans, can have two types of muscle mixed as part of their bulk. They will have some proportion of what is commonly known as 'fast-twitch' muscle. This is the heavy, well defined muscle associated with sprinters and weight lifters. This muscle type is poorly adapted for long-term, efficient energy usage which is why horses with a high percentage of this type of muscle will be sprinters and not stay longer distances. The second type of muscle is termed 'slow-twitch' and, as you have probably guessed, is good at long term use of energy but poor at short term and explosive energy release. So horses with a high percentage of slow-twitch muscle will be stayers. Most 2yos will have a mix of these muscle types so it will need experience to categorise them. A heavily built 2yo which shows enough maturity and development has the capacity to show above average improvement though the season. As a specific example the trainer BA McMahon often has this heavily built sprint type and they can show solid improvement through the season. 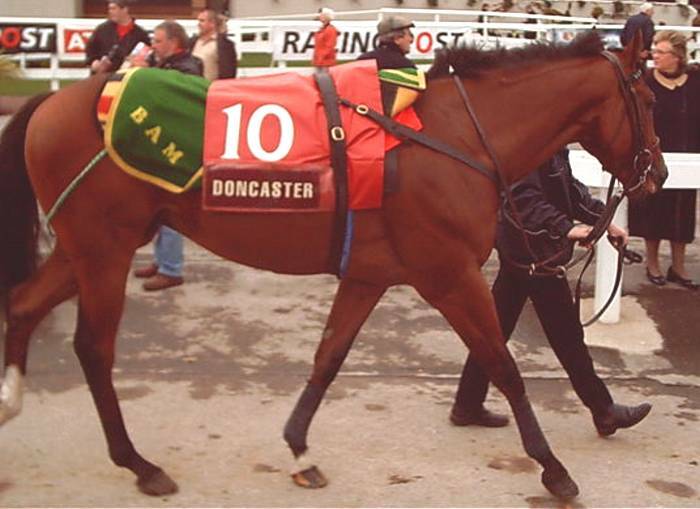 In the 2004 season both of his representatives (Pivotal Flame and Hidden Jewel) in the Doncaster October Sales race stood out from the rest as the field as more muscular and well prepared sprint types. They finished first and second but, interestingly, Hidden Jewel was 100/1 because he has run four poor races previously. This was a good example of how Paddock Review 'works well'. If you had looked at the field for that race with no knowledge of form then Hidden Jewel would have been one of the best physical specimens. If you had then been told he had run four poor races rating in the 50s you would have said that he might have another problem, possibly between his ears, because he was better than that as a physical specimen. That he runs well in the race is not a surprise to you, the fact that he's 100/1 would be. (GEOMETRY) is used by B2yoR to describe the shape and proportions of the various physical parts of the horse. "Geometry" may not be the precisely correct phrase but it does capture the desire to avoid details of 'horse conformation' approaches and instead use a high level, pattern matching approach. The following picture gives an idea of why it is called "Geometry". It is only necessary to describe features which are notably good/bad, out of proportion and so forth. No note for a particular part can be taken as meaning the area is normal and unremarkable. While it is possible to identify good features, such as above average depth of the main body it is not possible to specify what is the exactly correct length or shape for many of the parts. This is because all of the parts interact so that a 'good length' in one horse may not interact as effectively in a horse with a different set-up in other areas. So the results from this area of review is a description of the horse's shape and proportions. with scale ratings for each noted part. This approach has the added advantage of forcing a set routine to work through each area to identify any notable features. Experience has shown that if you end a review with a horse having no points noted, good or bad, then you probably have a solidly competitive horse at it's level. Horses that are 'unremarkable' overall tend to be usable within their ability constraints placed on them by their Size and Build. This area is probably the most difficult to describe and to lay down solid guidelines. The overall athleticism is assessed by judging the horse's walk, how well it carries itself overall and by watching it moving down to post (if possible). In judging a horse at the walk it is easiest to spot negative factors rather than positive ones. The starting point is to initially judge how well a horse holds and carries itself. This is affected by other areas such as muscle development, geometry and so forth. You should then be looking for how balanced and fluent a walk is and how 'easily' the horse moves. During this part you should be noting any obvious problems with the movement, for example if it is unbalanced or seems forced. The usual suggestion is that the walk should be judged by assessing how far the hoof-fall of the hind legs overlaps the hoofprints of the forelegs. The general implication is that the more the overlap the better and lack of overlap indicates a poor mover. This criteria has some useful ideas but cannot be interpreted in this simplistic form. For example, the amount of overlap is affected by the relative length of the horse. You could have a small, compact horse which can have a large overlap because it is so compact but it may be a scratchy, quick actioned and a poor mover because of it's size and build. The alternative can be true where a well made, but relatively lengthy horse may not overlap at all but will still be a good, fluid mover (although almost certainly lacking sprint speed). You will also find horse's with a large overlap but they clearly do not have full control of that movement. This type of weak horse will be a poor athlete and usually very slow. Too short, whereby the hind legs are well short of overlapping and the movement behind is obviously too short, inactive, scratchy, etc. Acceptable, ranging from not quite overlapping to well controlled overlapping. The acceptable group will be the majority of horses and they can then be judged on the more general criteria for judging the walk. There is a subsidiary advantage of at least looking at the amount of overlap in that you will start to recognise different types of mover. For example, you may start to recognise the quick, 'snap' movement of hind legs in sprint types. You will definitely see the longer, slower movements of stayers and will often be able to hear their relative slowness by the classic 'clip-clop' sound. The issue of Athleticism is considered further in an article on this site on the gaits that the horse uses. 'Togetherness' is another somewhat abstract area in these review summaries but is as important as any of the other areas for overall influence on performance. A horse with good 'Togetherness' can be defined as one that looks in proportion with all of the parts fitting together well and looking balanced. In a system which advocates taking a high level view of horses under review assessing togetherness, both of the horse as a whole and of major 'components' is essential. To use a well know cliché, but an apt one in this case, "if it looks right, it probably is right." A horse with good 'Togetherness' has the best chance to be able to express the full ability that it's physical type will allow. Conversely, a horse with good points in some areas but does not look balanced and 'right' will be less than the sum of its parts. B2yoR uses a rating scale between 50 to 90 to assign an expected best performance level rating. Exceptionally poor individuals are occasionally given ratings below 50 and outstanding physical types are, very rarely, rated above 90. The use of the range between 50 and 90 has been chosen to give some alignment between the rating and the expected 'actual' performance rating of the yearling on the racecourse (as defined by their Official Rating by the BHB (now BHA) 2yo handicapper). This system is still developing and experience has shown that the agreement between review rating and actual performance is best in the 50-74 section of the scale. If you wish to investigate this further yourself it is suggested you look at fields for nurseries (2yo handicaps) and also older handicappers where the Official Ratings are known. It is relatively easy to see the differences between groups of 50-59, 60-69, 70-79, 80-89 rated horses. For example, taking areas such as (SIZE) and (BUILD) the lower rated groups will obviously show some combination of small size and poor muscle. Experience has shown that the differences between a horse capable of rating 90-95 and one capable of rating 100+ are less obvious and much more subtle. This is probably because a horse capable of rating 90+ is already a well above average physical specimen. There is also the problem that there are far less horses in the 100+ rating band so there are less examples to try to learn from. 50-59 Poorest physical specimens. Those rated between 50-55 are likely to be competitive only in the poorest quality races. Those rating between 55-59 may be capable of competing in selling/claiming races. 60-69 Moderate to just below average physical specimens. Likely to be able to achieve ORs in the 60s (low 70s at best, probably in early season). Better types should be capable of competing well in sellers, claimers, lesser quality auction races and lower quality nurseries off light weights. 70-79 Average physical specimens and above but not obviously superior runners. Should include those horses capable of competing well in open maidens. Those rated 70-72 likely to be limited to low 70s ratings. Ratings 73-79 will include better types who may get ratings in the 80s by the BHA handicapper. 80-90 Well above average and superior physical specimens. Should be capable of achieving ratings in the 80s at least. Better types will be capable of 90+ ratings and be part of the relatively small group of superior 2yo runners. An example of the use of these performance ratings would be in quickly analysing nursery handicaps. With these performance estimates related to physical abilities available the usual process of form analysis becomes a secondary concern. The first step in looking at the race would be to compare each horse's Official Rating with it's Paddock Review rating. Only those horses whose review rating suggested they could win off that Official Mark or higher are considered for the shortlist. In many races this approach identifies one or two horses and they are rarely the favourites because they are targeting ability to perform at a higher level than the official handicapper believes has already been demonstrated. Races which show no horses with a 'positive' rating can then easily identified as 'tight knit' handicaps probably between horses whose abilities are well known. These are races to avoid betting in for the most part. The end of season ratings given to the best 2yo runners of the season. It is worth covering two other areas of paddock review which should be undertaken. The first is to assess the Fitness of each horse and assign a rating to it (a simple 1 to 10 scale is suggested). B2yoR suggests that the primary area to look at to assess fitness is the muscle definition on the horse's buttocks. The consistent application of collecting fitness information will have uses beyond the individual horses. For example it is possible to compare how fit, on average, a trainer's horses are on average. JL Dunlop is a good example of a trainer who has a poor first-time out wins-runs percentage with 2yos although his horses are usually above average fitness on debut. It is probable that the poor debut record is attributable to lack of mental sharpness of the 2yos and the trainer insisting on his 2yos not having a hard race on debut. The second area to assess is Behaviour. It is suggested that items such as sweating up and coltishness are really details and should only be assessed as part of overall behaviour displayed. In summary, unless a horse's behaviour seems bad enough that it will almost certainly effect it's performance then these minor issues can be ignored. Initially start by assessing behaviour on a Five Point Scale with 3 as 'Average' and nothing to report. Ratings 1-2 can then be negatives visible and 4-5 positive signs. If you note what the positives and negatives you felt you perceived which lead to a non '3' rating for a horse you will be building up a record of factors which you can assess for their usefulness. All the way through this article the point has been stressed that you need to take the high level view first (the "80%+") before you start worrying about the details. But it is worth finishing this section with an exampleof a detail which is worth investigating because it certainly has a noticeable effect on horse's performances. An example has been chosen which you can investigate both with on-course paddock review and by watching races on the TV. The issue can be titled "Nodding" and refers to how a horse carries and uses its head and neck when galloping. 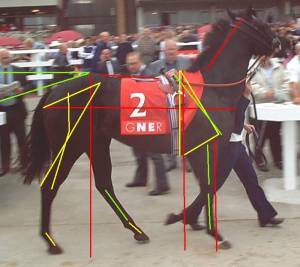 On-course paddock review will enable you to identify whether a horse's neck and head are in proportion with it's body and how it carries the neck and head. When watching a race look for how the horse's heads and necks move, especially how rhythmical the movement is. 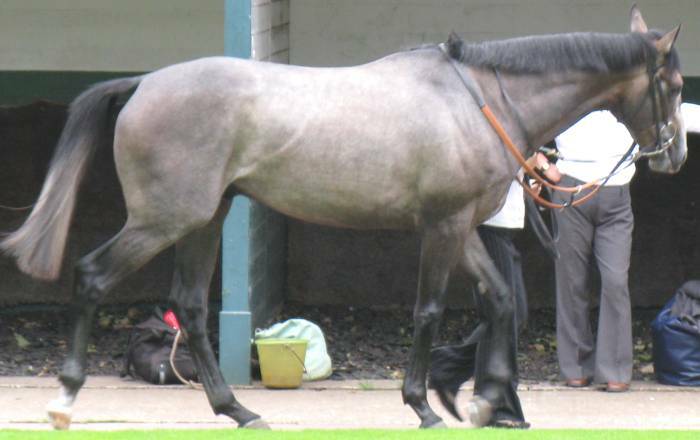 The classic example of excellent use of the head and neck in a metronomic, balanced and smooth way was Choisir on the firm ground at Royal Ascot and Newmarket in 2003. They are heavy structures carried away from the main centre of balance so they need to be in proportion and move correctly. They assist with the breathing (a galloping horse takes one breath per stride) with the horse exhaling as the head and neck go forward as it reaches with the front legs and they strike the ground. The horse then inhales as it lifts it's head and neck and moves into the suspension phase of the gallop (with all four feet off the ground as the hind legs recover to strike the ground under the body). If the horse does not move it's head and neck correctly then it is not going to fill it's lungs correctly. Look at high quality races and compare them to selling races - do you see any differences in Nodding? In the early stages of long distance races (including Hurdles and Steeplechases) look for the horses which are Nodding most rhythmically and efficiently. How do they perform in the race? What effect does this issue have with horses where their jockeys are pulling hard on the bit to stop them going forward. The received wisdom is that a horse which pulls too hard will fail because it has used up too much energy. What effect does having it's head held in one position have on it's breathing and therefore performance? Have an overall strategy, perhaps something like the one outlined here. Have a repeatable system for doing a review. Have a set format for taking notes about each horse. Put your notes into a searchable archive. In practice this means a small database on your computer. This isn't difficult if you have a package like Microsoft Access or Lotus Approach on your computer for example. Rate each element that you record, this is obvious for size and build but there should be a scale for everything. This enables comparison of your ratings with actual results in a useful way. Always include an overall rating of the horse. This can be as simple as 1-5 (1= Poor to 5 = V Good through 3 = Average) scale to begin with. The advantage is that it forces you to sum-up your impression so that you can't get away with interpreting inexact language like 'nice type' to suit yourself later. Obtain pictures of horses wherever possible. These will help to remind you of what you were thinking when you did the review. Believe that this is a job only for experts who've got the paddock review game sorted - they haven't got any magic insights, just more experience than you have. If you apply yourself in a consistent, analytic manner using some basic rules; constantly try to improve; go back over your previous work to check for errors and biases; then after you've done 'enough' hours you'll be competent yourself (and wont be hampered by unproven standard 'rules'). Get bogged down in details which account for a very small part of a horse's ability. Details are minor influences within the overall framework. Use imprecise or vague language. When you come back to a review it will be meaningless if the vague language allows you to interpret it in a wide variety of ways. If you have got this far with this page I hope you have got the positive message that Paddock Review works and is something that you are capable of. So it is now up to you to get onto the racecourse and get reviewing. It is worth reiterating a few points to bolster your confidence if it is needed. Don't allow yourself to think that this is an activity for insiders. We can take the example of Richard Hoiles (TV racing presenter) who seems to have the right approach to paddock review. However he often allows himself to get cowed into saying "he isn't much of a paddock man" despite the fact he usually talks as much sense about paddock review on TV as anyone. It is probably the case that he feels slightly intimidated by more horsey types among the pundits and presenters, given that his background in in accountancy (using concrete numbers & analysing things formally as positives in his favour you could say). But this reaction from him amounts to confusing Horse Welfare/Stable Management knowledge with the capacity to judge athletic ability which are separate activities. Hoiles gives the impression that he's trying to treat paddock review as an ongoing 'research' which is the correct approach. One of the problems with the existing insider 'mystique' is that it is passed on through the generations but doesn't appear to be based on any proper research. As an aside the same happens in Thoroughbred breeding whereby we do not have any understanding about the inheritance of athletic ability so that insider mystique, fashion and unsubstantiated theories can hold sway. Your own reviewing starting from a solid base will be more useful than trying to use the historical methods. To encourage you further it is worth remembering that assessing physical types and developing simple pattern matching as part of this is entirely natural to you. You already judge and assess other human beings as physical types and characters every day without even knowing you are doing it. If you were asked to describe a person as a physical type, assess their movement and describe their likely athletic aptitude you would be able to do it naturally. The same approaches and factors are at work when assessing horses, all you probably lack is the belief to apply them and the experience of having done it. The Virtual Paddock pages present real examples of groups of 2yos which were assembled for races. The pages contain pictures of each of the 2yos and invites you to assess them and put them into particular descriptions. This is a cut-down version of a Paddock Review and clearly you have less information to work with because you a working with single, two dimensional pictures. However, it is interesting to see how successful you can be at assigning the horses to the descriptions with the information available. To get the correct answer for each of the Virtual Paddocks please send an e-mail request to the B2yor Contact address. As discussed in the Foreword above this section is not going to be a detailed updating of the B2yoR Paddock Review methods. It is a more general consideration of the topic along with some thoughts on how 'Classical Review' can be used. A good follow on question is how the two types can be integrated. "...but it does not answer the question of what should be done when little or nothing is known about the form of the protagonists. You cannot pick a yardstick - even an imaginary one - when no yardstick exists. Time analysis and some form of breeding analysis can both help to solve the problem, but a far more powerful and more widely applicable tool is race standardisation." "It can be shown that certain races and race types repeat the same sort of level of form, year in, year out, once adjustments have been made for field sizes, margins between horses, race times and so on." "When dealing with two-year-old racing, some form of standardisation is almost unavoidable. 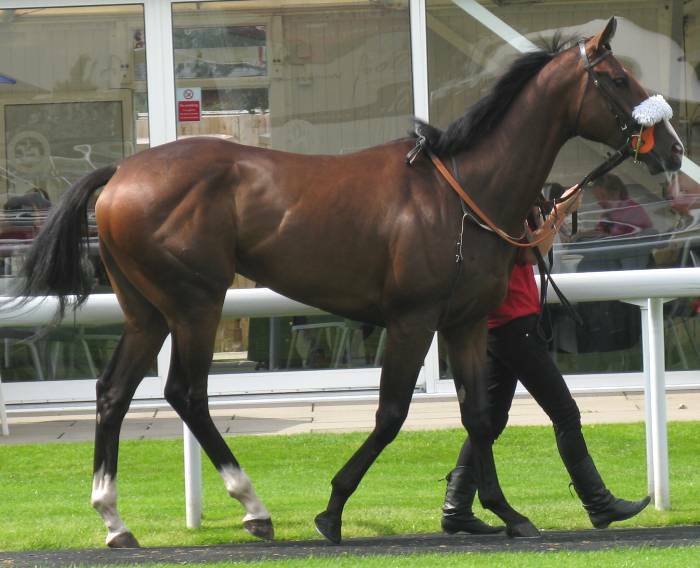 For instance, when assessing the Brocklesby Stakes, for unraced juveniles, it is highly desirable to have at least some idea of the ability the winner would usually be showing in winning." "However, in the absence of race-specific standards it makes sense to fall back on general standards, modelled from wider information (e.g. from the level of form usually achieved in maidens at a given course at a given time of year). You then apply the figures to the race under consideration - the one just run - and weight the outcomes appropriately." The quotes show a particular response to the 'problem' of dealing with races where established form is not available. Assume that in a 'Closed System' like the races in a 2yo season that some of the races show very similar form each year. Then use that to standardise form levels and ratings by aggregating perceived performance at the 'Race' level. Mr. Rowland goes on in his blog to show how the phrase "..and weight the outcomes appropriately." from the last bullet point above provides a starting point to apply various methods to try to make the standardisation closer to the real ability displayed. At one level this is all fine but it misses both some fundamental points about how racing works and how a different approach can bypass much of the fiddling about with weightings that are described. Also, because the major handicappers such as Timeform and the BHA's own official 2yo handicapper are using versions of this approach the figures they produce are already available to 'everyone'. How are you going to find an edge in that set-up? If you believe the ratings produced by this approach are flawed to various degrees through a season and mask a lot of the interesting structure in horse's development, as B2yoR does, then what are the alternatives? The blog lists 'Time' and 'Breeding' analysis as possible approaches to assist with the problem. The first of those is truly useful and the second of very limited value and easily bettered by a different approach. Mr. Rowland hints at a possible way out when he says "When dealing with two-year-old racing, some form of standardisation is almost unavoidable..". The answer to the issue at hand is actually 'Horse Standardisation'. The B2yoR approach would say that every 2yo race is full of performance quality 'Yardsticks' before it is even run if you go and Paddock Review the horses. Even if you misplace one or two of the field on the ability rating scale on a single review the whole set of Reviews will highlight these when you look at the shape of the actual result. Rather than try to devine what the performance level was by looking at the whole 'Race' in the context of previous years, instead go directly and look at the small number of 'particles' (i.e. the horses) that are interacting to produce the result. Similarly with 'Breeding Analysis. Rather than trying to assess what sort of athlete the horse might be, given the range of abilities and types the parents have produced. Go and look at what type of athlete the horse actually is. What genes it has really inherited and had expressed in it's physical appearance. The core of this discussion is a similar argument that turns up in many places. Is it better to model how a 'System' is working and what results it is producing by looking at the properties of the fundamental particles or the aggregated behaviour that they demonstrate as they interact? Warm a gas in a box and model what it does by trying to follow individual molecules or calculate the statistical response all the gas treated as a single block will show. If you want to investigate how an Economic Market (and Betting Markets) will develop then should you model the motivations and actions of individual Traders? Or compare the Market state to previous similar situations, the equivalent of 'Market Standardisation'. The B2yoR argument would be that aggregating at the 'Race' level is too high and hides a lot of Rating structure and variation that can be usefully applied in race analysis. The 'Horse' in this case is not a 'Fundamental Particle' which can be ignored in a statistical approach. The horse is already a large aggregation of performance fundamentals and factors and can be treated as an aggregation level in itself. To hammer the point home the following should make a 'Race Standardisation' adherent go cold for moment. If it does not then they have not really understood it. Why does the 'Race Standardisation' approach work at all to any level? The answer is that it is the result of adding up the outcomes of countless individual acts of Horse Standardisation. When a Bloodstock Agent or trainer reviews a yearling for purchase they are Paddock Reviewing the horse. When a trainer looks at a horse and decides when to start it's training regime and what work to give it the same review is occuring. When a jockey rides a horse in work and reports back to the trainer about how it moves and what gears it has they are doing a specialised form of Horse Standardisation. One that is not available to most of us or has to be surmised from visual clues at a remove. When a trainer decides what type and quality of maiden to run a horse in based on all the Horse Standardisation undertaken it is an absolutely key part of the system that Race Standardisation is trying to plug in to. That decision along with the 'Closed System' which means only a relatively small number of horses and races are available each season underlie the success of Race Standardisation to any level. Figures measured in thousands are actually small in this case. But, when you realise that Horse Standardisation is the real causative factor underlying everything why would you not try to cut out the 'Middle Men'? Go and look at the horses and find some beautiful 'Truths' waiting to be discovered instead. Experience working with a range of people has shown that their ability to assess a horse's size is moderate. Especially when faced with larger fields and busy backgrounds. In some cases the stature of the person undertaking the review seemed to affect the ratings recorded. Judging height and size is affected by visual effects which are 'illusions' to some extent. In a classic example you could take two horses that were the same height but with different body depth and leg length ratios. Consider the case whereby one horse has a shallow body and relatively long legs and the other a deep body and shorter than average legs. With a limited length reviewing period available the majority of people will overestimate the height of the leggy horse and underestimate the shorter legged one. A problem if the leggy horse lacks the bulk to apply a good amount of power to it's movement and also an issue in that a strong bodied horse is getting relatively downgraded for a top level factor. In the B2yoR case working on older horses as part of the 'Classical Review' project disrupted the 'Mental Model' of relative sizes expected to be seen amongst the juveniles. The older horses being bigger as a group. This made the recording of the Size variable for 2yos less effective. A review of the historical Database of Paddock Review data showed that strongly built, sprint, 2yos of acceptable Size although perhaps below 'Average' were being undervalued. The 'Size' matters approach in terms of height and frame had been taken too far. Other work on analysing races had led to a 'Powerball' approach whereby the energy reserves of the horse and how efficiently that power was output in a race was the core of the model. Given that, trying to allow the Paddock Review to record the 'Powerball' and use efficiency factors as input to that model was worth investigating. The outcome of this has been that the Size variable is still recorded but with a simple 1-3 range with most horses in the 2 category of average. How the rating in this area is factored in has also changed. Another simple 1-3 figure is recorded to assess the usable, well controlled, range of movement the horse's Frame allows. This clearly links to the Athleticism factor which is dealt with below. It is an important development given that stride length is believed to be a key distinguishing factor in assessing the expressed performance of the horse in a race. Build has changed name to Strength/Power to reflect it is about assessing the power available to the horse in the race. Three numbers are recorded including an overall summary of the physique on show and the horses split into a small set of groups by expected distance aptitude types. Again the way that the figures are factored into the final rating has been altered slightly. In summary, not huge changes but adapting the data recorded but in ways that means the new figures can still be directly compared with the existing database of Reviews. Another area of refinement has been with the Athleticism Top Level factor. This has been renamed Efficiency and is a now a factor whereby issues other then just movement athleticism can be recorded. The change has been very useful although B2yoR would understand if someone's response was that this might appear to be just playing with words. The issue to grasp is that defining 'Athleticism' is a difficult task. Try reading various efforts at describing it in horses and you will get a variety of approaches and all will fall back on a "..I know it when I see it.." appeal at some point. B2yoR has found that you can escape this bind by replacing questions about perceived Athleticism with ones about Efficiency. Rather than asking someone to assess how 'Athletic' a horse appears instead ask them to assess whether what it does in certain areas is Efficient. It is much easier to assign a meaning to 'Efficiency' and split the assessed factors into at least the normal Below Average, Average and Above Average grades. If your model starts with Powerballs expending energy in races then the Efficiency approach becomes natural. The horse's movement can still be assessed in some ways under the Efficiency banner but using measurables that are easier to quantify than a vague appeal to Athleticism. Something had to be done in this area because years of collecting data about horse's rear hoof overlap of the front hooves placement had been inconclusive, at best. Therefore, a more structured approach to collecting useful information in this area had to be implemented. The final point to be noted in this area is not a full change to the Paddock Review method but to comment on a particular area and how it interacts with basic ability estimates. The example given here came out of an e-mail exchange with a reader of the site who was looking for clarification over judging Fitness amongst other things. So part of the reason to mention it here is to encourage the type of questioning involved for those that are interested. The key point to understand here is that relatively unfit horses do run well and understanding why relates to interesting issues about trainer methods and the career development of the horse. A good example of how Paddock Review can help with a fuller understanding of how racing works. 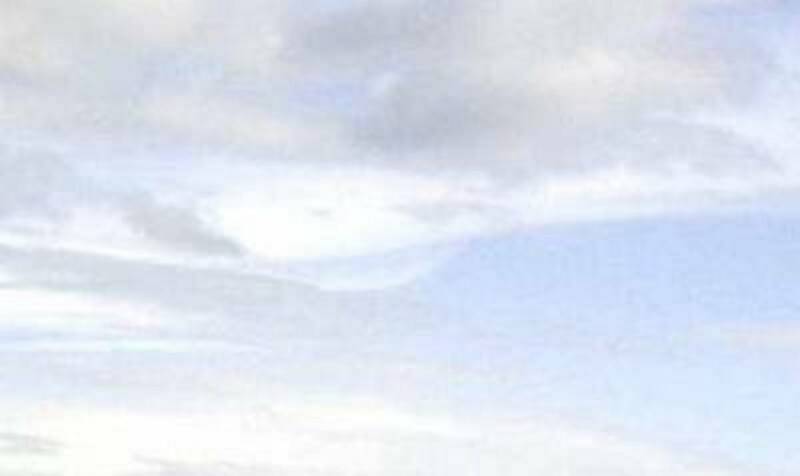 Consider the two pictures below and note that right-clicking on either picture with your mouse should bring up a full size version of the image. The two pictures are from the 2008 season and both horses are on their racecourse debuts. Both have been given Official Ratings well over 100 in their careers but their development followed entirely different paths. Whilst to some extent this was because of their distance requirements and physiques B2yoR would say that the major determinant has been the trainer's they started with and the methods those men use. Swap the two horses over and put them with the other trainer and their careers would almost certainly have been very different. The picture on the left shows Marine Boy on his Newbury debut which he won by a clear 9 lengths and you can argue he was never as good again as he was on that first run. Look at his picture and see how fit he looks with tight loins and no spare flesh overall. The muscle definition around his buttock is of a level that some trainers never achieve. It is at the level that David Evans would manage with one of his 'hat rack' rabbits after a few runs when he knows the horse is expendable and has to win 'now', if at all. 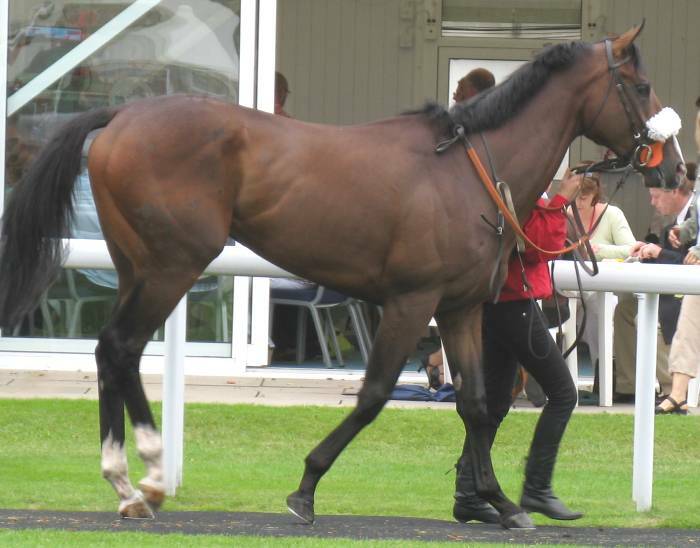 Or perhaps like a Gary Moore trained hurdler when it is a 7yo and had lots of runs and many seasons in training behind it. When Marine Boy appeared for his second run he already looked to be going 'over the top' and looking too light and with his attitude more lethargic (Picture). Since his startling debut he has run 12 more times and managed a single place. 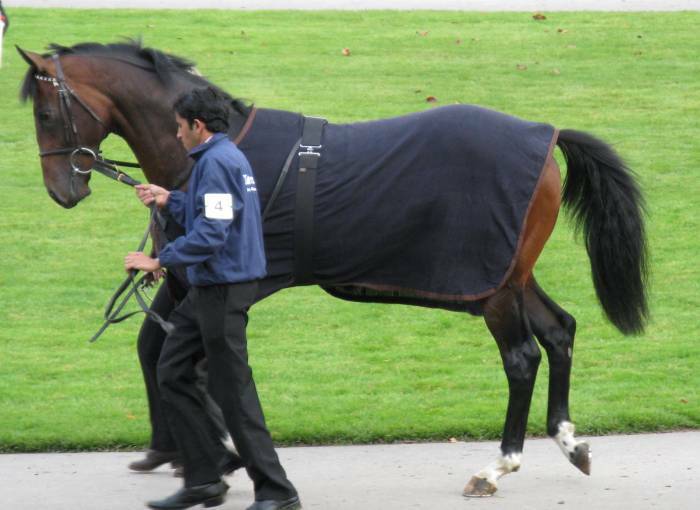 Having been rated OR109 at his 2yo peak he was soundly beaten off OR92 on his only run in 2011. Clearly an example of a high fitness rating being good for one run but needing other factors to be recorded to understand how the horse might perform. Marine Boy ran for trainer Tom Dascombe and a notable part of his early training career was how he wound horses up for their early runs. They would compete well on these initial runs with their superior fitness but their careers would typically have peaked before the Autumn of their juvenile career had arrived. Those that bought the horses who he had 'hot housed' into 'Black Type' wins and high Official Ratings this way had limited success with them in their later runs and the 'Marine Boy' career path typical. Now look at the picture on the right which is of Glass Harmonium on his Sandown debut. How does he compare to Marine Boy in terms of fitness? Flabbier all around, little buttock definition and a hint of a 'belly'. You would have to rate him below average on fitness and he finished unplaced. He was only slightly better and tighter on his second run when he won a Yarmouth maiden comfortably. The Official Rating he got for that was OR86 with a portion of that figure pumped in because of his connections. Why would a trainer as successful as Stoute leave a horse 'underdone' like that at 2yo? The reason is that he is playing a long game of developing a career and not looking for fast returns and impact like Dascombe. Stoute knows this horse is going to be capable of running to well over OR100 as he gets older so he wants a slow start so he gets a usable OR that he can go into handicaps with. In the case of Glass Harmonium he could easily have been one of those 3yo handicappers who wins a big Newmarket handicap in early season off OR86 then another at a major track off an OR90s figure before going in Listed and Group races. Stoute had left the horse somewhat unfit at 2yo because he did not want his OR110 horse revealing that as a juvenile and limiting his options in winning races. You ensure your high class athlete only runs to a good enough level to win a maiden and gain some experience, and a usable OR, by leaving it underdone. Stoute is clever and experienced enough to know exactly how to prepare a horse to get the job done. A horse like Glass Harmonium might not show up on course as strongly fit until after Royal Ascot of it's 3yo season with Stoute expecting to be able to gradually improve it over 2-3 seasons. If you just look at 'Fitness' without factoring basic ability you will be baffled by the wins for a horse classified as unfit. B2yoR could attest to a number of occasions of watching Classical Reviewer Ken Whatshisname standing in winners' enclosures shaking his head when faced with such a winner. Factor in real ability and the knowledge of how racing works from the B2yoR Paddock Review and things make more sense. To wrap the story up Glass Harmonium was owned by Ballymacoll Stud who presumably said to Stoute they would rather go for Group races then paddle around mopping up handicaps to start his 3yo season. 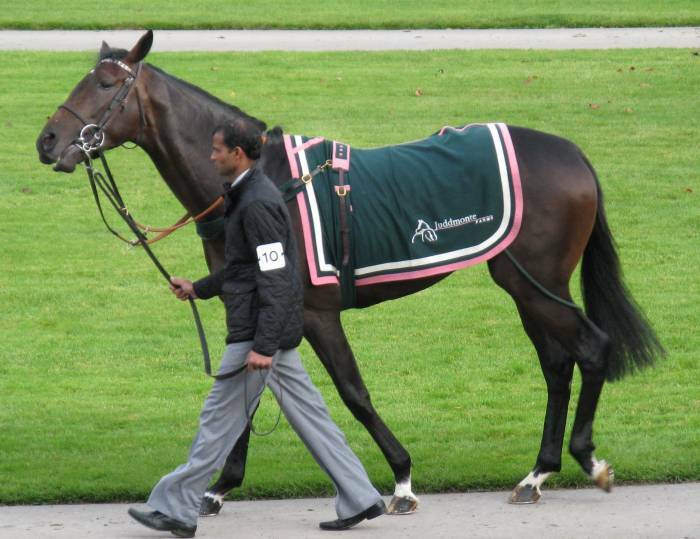 Rather than running in a handicap he began his 3yo season in April at Newmarket in a Group 3 Guineas trial. During that year he won a Listed race and placed at Group 3 level. The Stoute plan to keep him slowly developing was working though and as a 4yo he managed a Group 3 success and had a go in Group 1 events without placing. As a 5yo he transferred to race in Australia and has won at Grade 1 and 2 level out there although it is difficult to ascertain whether that amounted to an improvement over his British performances. The final part of this Afterword sub-section will give a small insight the 'Classical Review' project that B2yoR was part of and draw out a few of the the points of interest. The project was funded by a Hong Kong based betting operation who were the largest in the world at that time but were looking to expand into other countries. The total of the 'Pool' that they were betting into in Hong Kong was declining and the percentage of the money in the Pool that was theirs too high. They set up an operation in Britain and ran a number of projects to see what local data they could collect that could be usefully fed into the computer models they were running to make their bets. Initially this targetted following SP Market moves on-course. But, they had arrived just in time for the 'Betting Ring' in Britain to become mostly empty and a minor player compared to the online betting. Which meant the on-course team were redirected to collect Paddock information. B2yoR was initially involved in the set-up training before working full-time with the project later. The Hong Kong team used 'Classical Review' successfully in Hong Kong as part of their daily operations and collected data about the typical core of this form of review - Coat Condition, Fitness and Attitude - along with items such as Sweating, Bandages. In the British incarnation they also collected size and build estimates. If you were looking for reasons why the British project eventually was dropped then the fundamental differences between Hong Kong racing and that in Britain would be a major reason. The issues created by the set-up in this country were perhaps not handled fully. Consider the shape of Hong Kong racing that a Reviewer works in. A horse population of under 1,000 and a lower ratings level in the OR90s so you are looking at better horses. As a general rule B2yoR would say that Classical Review factors show up better with higher class horses. There are only two racetracks and all work is done on the track. One person can assess all the horses all the time or work with another reviewer and they can cover everything fully, doubly. If they happen to want a day off or miss a work session then the local Television channels show daily work programs. Luxury. Easy to build up a Career long set of Reviews of how the horse's condition has developed and changed and to compare that to his expressed form in the relatively small numbers of races run in the country. How does that compare to Britain? Where the horse population is more than 10,000 and a wide range of abilities. 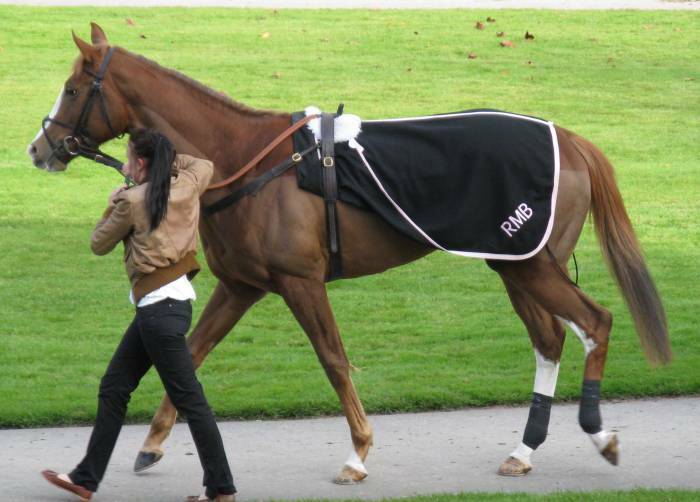 60 different racecourses spread all across the countries and a large number of races. Seven or eight meetings on a day during the summer with hundreds of horses taking part. The horse's are spread even wider in terms of their training establishments and, with the exception of two or three larger centres, all work is done in private. Come to that environment with your Hong Kong approach of a single person building up an almost daily set of wellbeing reviews and you have some issues to manage to get a successful outcome. A major issue is how to ensure the team of people you need in Britain do their reviewing to a consistent pattern and produce data that can be merged together. The reviewers will not see horses on every run so will not see the full wellbeing progression themselves. A key part of the Hong Kong model was to "get to know the horse as an individual.." to assist the reviews. This is so that you can have a baseline to judge a horse by. For example, some horses will appear 'Lethargic' in attitude on a first viewing and will be marked as a negative and they will then run very well and perhaps win. The horse isn't lethargic but a 'Quiet Professional' who will always look a bit quiet in general terms and that needs to be factored in. Tight guidelines on how to classify the factors under review into the available categories. Ongoing training and review to solve inconsistencies as they become apparent. A summary of items to note about horses, like the 'Quiet Professionals', to refer to before a day's meeting. Texture (one reviewer ignoring the other factors entirely). If we take the example of another major Betting Syndicate who have been sending Reviewers to every British race meeting for more than 10 years how do they solve the issues? You can spot their representatives at a meeting because they will be the reviewers using powerful binoculars even though they are stood relatively close to the horses. They will also be favouring positions that allow head-on views as well. They solve a lot of the consistency issues by constraining tightly the feedback the traders require from the reviewer. Rather than a range of figures across a number of factors these reviewers are required to send back just a single figure for each horse. Unless the figures contain a lot more coding than is apparent then this cannot amount to much more than some version of Good-Ok-Bad classifying. But, it clearly adds value to them and they have built up an impressive database of reviews to compare against performance. B2yoR was a convert to the value of 'Classical Review' but used in Handicaps to sort the field into a version of the Good-Ok-Bad ranking. In fields of lightly raced horses where there is a wider spread of ability and the Official Ratings not known then the B2yoR Paddock Review is clearly better. The 'Classical' approach when done regularly also shows up more general issues which gives insights into the workings of racing. If you see horses regularly then you will see their level of expressed wellbeing change through a season and can compare that to the results they show. Some horses seem to bypass this and look great all the time and the level they run to shows less correlation. Some trainers are very good at getting their horses to look well but still show a progression. Examples will show up where Stables really do come 'into form' with a number of their runners all increasing in wellbeing at the same time. But, to reiterate, the Classical approach is best used in trying to get an edge with closely matched horses in handicaps. A good example would be a day of big field handicaps at Ascot. Lots of higher class horses involved who show their wellbeing more immediately. Look at the 20+ runner fields as 'Form' and they can seem impossible to make progress with. Forget about form and just do 'Classical Review' and a shortlist of strong contenders will usually present themselves. Good returns resulted from these shortlists over a 3 year period by adding some thought and general knowledge of racing at Ascot such as track biases. An acquaintance of B2yoR, while not a full-time professional and a draughtsman by trade, was a member at Ascot and expected to supplement his wages notably from his betting in tough Ascot handicaps. Press him a little for what he is doing and the answer was a Cross-through-to-3-Ticks system based on Classical Review to produce the shortlist and a spot of 'Powerball' type strength assessment to improve the input. He never looked at the Form Book at all. To conclude this section let us consider another acquaintance and link his initial approach through to the lightweight world of the TV Pundit. This guy was one of those people that stand somewhere near the One Furlong out pole with a mobile phone talking to an associate who was sat in front of a computer screen ready to trade on Betfair. Finding his edge in the small number of seconds picture delay that most people watch races with yet still feel it is worth them betting 'in running'. A bit of 'inside if wet' since the Racetech picture feeds at the racecourse are still well ahead of the off-course feeds. Since he was already on the course and at a loose end between races then why not turn himself into a reviewer. Which he did but not before going through the lightweight stage characteristic of the Pundit. The classic symptom of this is the belief in 'Golden Bullets'. This phrase indicating that people expect simple answers when they start and that assessing a single factor will produce strong bets in every race, backing or laying, with little work. When he started he would regularly ask B2yoR to give him a horse he could lay as soon as the horses came into the pre-parade ring. Then be miffed when the offer was declined with the hint that reviewing was more subtle than that. It was about graft and application to move the balance a bit more in your favour in the long term. At times horses would show up who were clearly not going to perform well but not in every race and it might take a more to assess than looking at a single feature. Initially he thought this was nonsense so used the knowledge he had gained from reading a few pages on the Internet and laid his snap choices anyway. Refreshingly honest, he would always admit he had "done me dough" after nearly all of these efforts which meant that he soon learned from experience and started putting the graft in, to his real credit. If we turn to the Pundit then, unlike the guy above, they can prattle on about imagined 'Golden Bullets' without doing any of their dough. Instead just carrying on with their lifetime's work of misinforming the racing public and never stopping for a moment to question anything or do a bit of worthwhile research. Let us consider the issue of equine sweating and the Pundit since it has become an item that they seem to think has 'Golden Bullet' pretensions. So says who? Where has the Pundit got this insight about sweating between the hindlegs from? What research is it based on? When you see that white froth between the legs is that the sweat? Why don't the Pundits get as worked up by bits of froth that appear where the saddle is rubbing and along the neck where the reins are? Why are we bothered by sweating at all? Isn't it just a way of dumping heat to keep the body at the ideal temperature to ensure the metabolism keeps stable? Surely all horses sweat and some a bit more than others. Like the difference between cricketer Alistair Cook, who famously does not sweat much, and his team mates. The first can run about for 6 hours with a batting helmet on in hot temperatures and walk off at day's close with dry hair. The others look bedraggled on the way out and have to remove the helmet at intervals to tip the sweat out. But, all can get the job done. The first bullet point questions should be directed to the Pundits but we could suggest that it isn't based on anything. Instead the usual repeating of hearsay evidence with no underlying basis. The project B2yoR was involved in recorded sweating and the location of it on the horse's body. You could argue that this sort of recording was less prone to the consistency errors that other factors might show. The results of that work did not show any correlations between sweating and performance that you would want to rely on. The second bullet point opens up a fascinating subject and an area that the Pundit could usefully read up about. The 'White Froth' is not sweat which is mostly a clear liquid and will show up as darker, damp patches on the horse's coat. If the pundit wants to highlight sweating they need to go beyond the visible froth and report on the damp patches between the legs, as well. What is the white froth then? Horses are flight animals that have a particular problem in dissipating heat efficiently during periods of sustained exercise. To do this they thermoregulate by producing copious amounts of sweat, a mechanism also used by humans but otherwise rare in mammals. Unlike humans, horses have a thick, waterproof, coat of hair. Sweat provides cooling by spreading over skin and then evaporating and removing some of the body's heat as it does so. Without some help the sweat will just drip off the horse's coat and fail to do the job required. To stop this the horse has evolved to produce a protein called Latherin (the clue is in the name) which acts like a detergent and spreads the sweat across the skin. Where the sweaty skin is rubbed by equipment like the saddle and reins it will lather up the protein and show up as the white froth. The muscles between the legs rub against each other to produce the same effect. When a Pundit highlights a horse at the start with a bit of white froth between it's legs it is just daft. The horse has been involved in physical activity and the muscles have been rubbing against each other as it goes down to the start. Why would there not be some sweaty froth on display? The horse also produces Latherin in it's saliva to assist with grinding down the dry food it eats. Which is why they can also froth from their mouths copiously. The reason why there might be something to learn from sweating between the legs is that the horse might be producing it in response to a hormonal change and not just to dissapate heat. Perhaps they are getting worked up before the race because of fear or, conversely, because they are too 'up for it' and using up energy before the race. But this is not a 'Golden Bullet'. It will be the case in a few horses and you need to know your horse's normal demeanour. In B2yoR's experience somewhere in the temperature range 15C to 18C all horses, except the odd equine Alistair Cook, will start to sweat to some extent. So in a normal British summers you will be struggling to differentiate even the few horses that the between-the-legs sweating might be an useful indicator in. Hopefully you will have got the message that this is a tricky subject and looking for easy answers by observing single factors is not a good starting point. One day perhaps we will get some pundits that try to engage with the wider picture. You wonder why they do not since if you want to fill airtime then extending the knowledge and areas you can talk about assists this? Surely. If you want to believe in 'Golden Bullets' then here are a few ideas of places that might be worth more of a look before spending your life inspecting horses' backsides. On the Positive side then look into 'Dappling' (a B2yoR favourite) and the 'Drivetrain Coil'. The second of those a favourite of the person B2yoR respects most as a Classical Reviewer although a factor that needs some care to judge when the 'Positive Energy' has gone 'Bad'. On the Negative side the closest to 'Golden Bullets' come when judging Behaviour or Attitude. Horse's who are no longer 'with us' and not responding to the handler include several subsets who never win. The 'Gone Inside' and the 'High on Life' types for example. With lightly raced horses then if you can learn to identify very inexperienced ones then they will almost always fail even if there are good physical types. Being inexperienced is very inefficient. Look at some horses in the pre-parade ring and you will just know this thing will stand still when the stalls open and not know what to do. As a lead in to the new Virtual Paddocks try looking at the three pictures below of 2yos on early career visits to racecourse. Which one was the clear winner who responded vigorously to a late challenge by a good quality Godolphin horse and had marched around the parade ring looking businesslike. The other two finished well beaten and both missed the break and needed driving along to get going and were inexperienced in different ways. Both were clueless when asked to make an effort in the last two furlongs and can you spot which one folded completely having been too lively in the preliminaries. Or, alternatively look at them in terms of ranking them for efficient purposefulness. This Afterword closes with two new Virtual Paddocks for readers to try to solve.